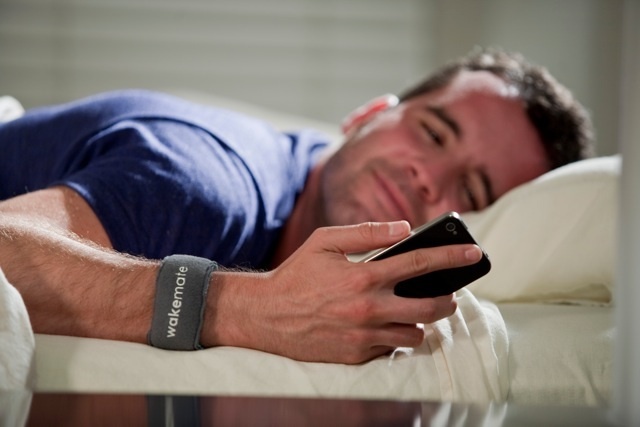 The WakeMate is a wristband that tracks movements in your sleep and when paired with an iPhone, Android, or Blackberry app serves as an intelligent alarm that wakes you at an optimum time in your sleep cycle based on actigraphy, a method of monitoring sleep through tracking movement. To use the device you wear the wristband, sync it via Bluetooth on your iPhone, Android, or Blackberry phone, open the WakeMate app, and set the alarm to a certain time which provides you with a 20-minute waking window. 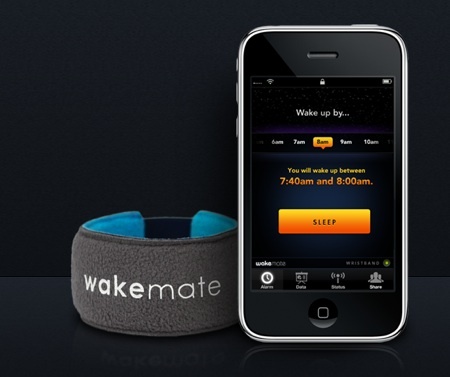 For example, set your alarm within the WakeMate app to 6:42 AM, and that means it will wake you between 6:22 AM and 6:42 AM. The band uses your phone as the alarm that goes off at the predicted optimum time based on movements in your sleep, in effect waking you when you aren't about to dive into deep sleep but instead are coming out of it.